It was taken last August 16 during my tour at Canada Aviation Museum, one of the beautiful tourist attraction of Ottawa, Canada. This aircraft entered service in 1934 with United Airlines as a 247 and was converted to a 247D the following year. 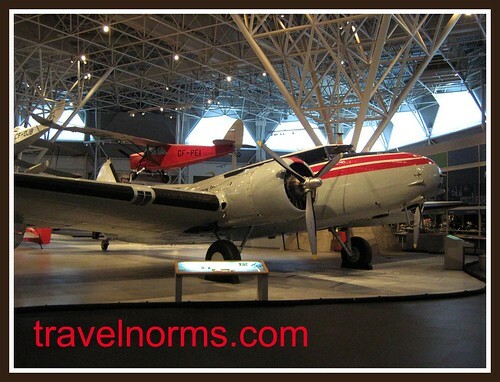 Over the years it served many owners, including the RCAF, Canadian Pacific Airlines, and, finally, the California Standard Oil Company of Calgary, where it remained in service until donated to the Museum by Chevron Standard Ltd. in 1967. What heroes they were flying these machines. Thank you for the photo and the bit of history. Ralph is going to like this! Great picture! Thanks so much! Nice photo and love the history. Need to put that on my list to visit. The 247 was the first metal monoplane, forgotten as the bigger DC-3 sold more planes and carried more passengers. The look is of the early 1930s Art-Deco, the red trim a real accent to the classic lines. An important plane in history, lovingly preserved in the museum. Nice! A handsome piece of history! I love the composition of your shot with the two planes and the intricate pattern overhead. I'd love to go to that museum! Did you see Ralph's post? Nice plane sis with a piece of history that comes with it. Nice bit of red history! Interesting post. I learn new things everyday from the blogs I read. Today I learned a little about aviation history! An interesting piece of history. Great angle shot and good composition. P.S. Igsoon mo ni Agring (Lady in Red). I visited your mom's blog, too. This is pretty...Mine is ready. nice pix sis...red gayud..pati ang watermark...join this meme 4 the first time. That aviation museum must be interesting! I see my husband (Ralph) has already seen your post :-) He is an aviation nut.